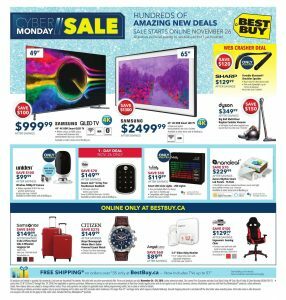 Best Buy Flyer Boxing Day Deals 4 Dec 2018 available to check here online. Hundreds of amazing new deals sale started now. Visit a Best Buy store and find your favorite electronic product. For the boxing day, Samsung QLED TV and the other Samsung products on sale. If you are looking for the new TV for your home or office, Samsung would be a great choice I think. I also like Phillips PUS Series. With Ambilight technology, you will feel inside of images. Boxing day deals amazing at Best Buy. Best Buy Flyer Boxing Day Deals 4 Dec 2018 contains special boxing day deals. I hope you will find your favorite thing. I love Best Buy deals like always. You can save over $100 for each piece. Is your Christmas tree ready? Let’s make some big differences about your tree. Christmas tree decoration and lightning are available in this flyer. Enjoy your shopping at Boxing Day!